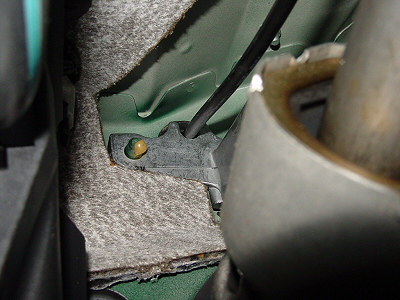 Back in 2005 we performed an installation of our a-pillar gauge pod and VDO boost gauge on a 98 B5 Passat. Throughout the process we took some photos of some critical areas such as hose and wire routes. 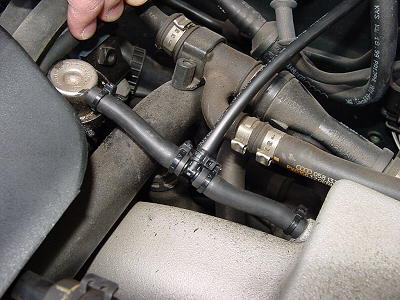 While not a complete DIY, the following photos should help you easily locate some critical areas of the installation. Our first order of business was running the tubing to the engine bay. We located this empty grommet above the throttle pedal and routed the tubing through. 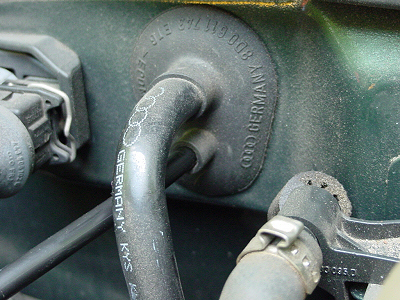 The grommet is partially blocked by a metal bracket which made routing tricky. We ran the tubing from inside the car to the engine bay. 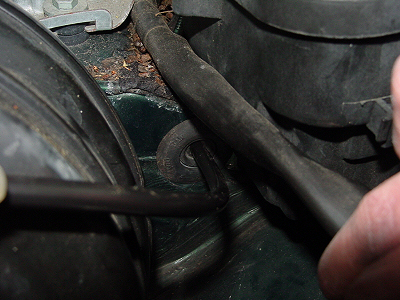 The tubing came through the firewall to the right of the brake booster. We routed the tubing into the engine bay through this grommet which also houses the brake booster tube. 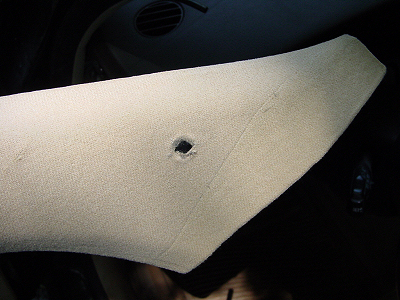 We had to cut the tip of the grommet to open the hole. Routing from the grommet to the FPR was relatively direct. We noticed that the OEM vacuum line was completely dry-rotted so we removed this line and replaced it with 3/16" ID rubber vacuum line. We spliced the line and added our restrictor T fitting. We connected the boost gauge to the restricted barb and added some zip ties to secure the tubing. We then tightened up the slack in the line and ran our tubing above the pedals and up between the dash and the a-pillar frame. The a-pillar and lower / side dash panels were removed already. We also dropped down our power and ground wire for the boost gauge light to the dimmer switch area. 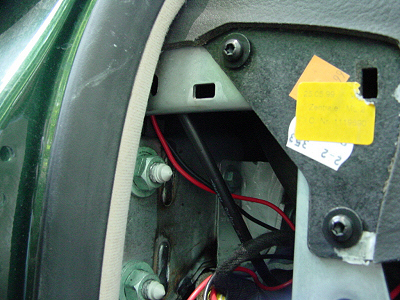 When removing the lower dash panel we unplugged the dimmer switch. With the dimmer switch wiring hanging loose we were able to tap the appropriate wires for our LED. We confirmed that the brown wire was ground, and the gray / blue wire was outgoing power. We stripped back 1/4" of each and soldered in our power and ground wires. We soldered the black wire to the brown wire and taped it. 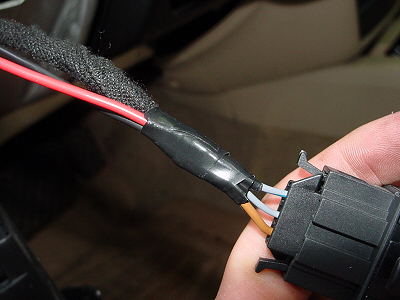 We then soldered the red wire to the gray / blue wire and taped it. Next we tested the boost gauge and the LED. With both functioning perfect, we moved on to installing the a-pillar pod. 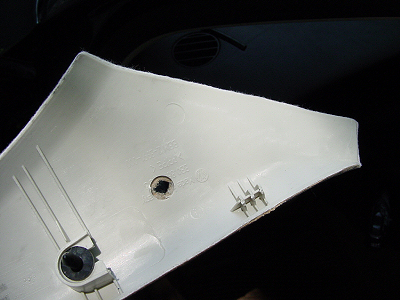 To route the wiring and tubing in the Passat a hole must be drilled into the a-pillar. Our instructions give more guidelines for drilling this hole. You may use these pictures for reference in addition to the instructions. With the hole drilled we installed the a-pillar pod, reinstalled the pillar trim and did a final test. Final pictures can be found on our Passat A-Pillar Pod page. This was not designed to be a complete DIY, only a pictorial reference to the installation. All the installation instructions you need for installation can be found on our tech page. An instruction book is included with all orders of this product. Hope this helps!